I love figure drawing. 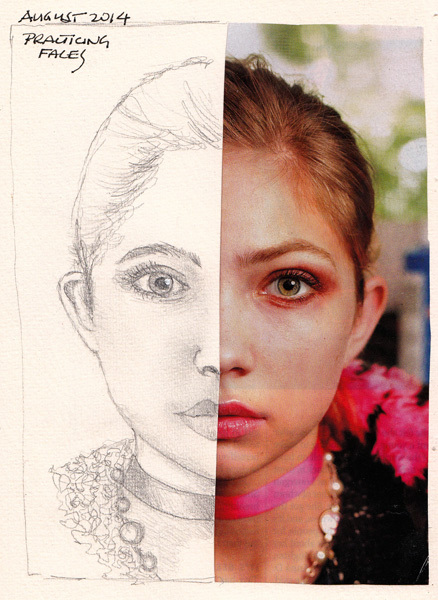 And often practice drawing faces from photos that I collect. This portrait is an exercise from an unknown source, but it allows me to try to work with the same facial proportions as the original photo. 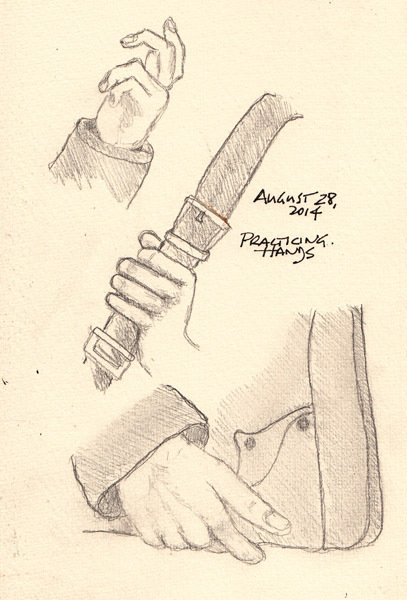 I also clip and copy hand photos from magazines in order to practice drawing hands. 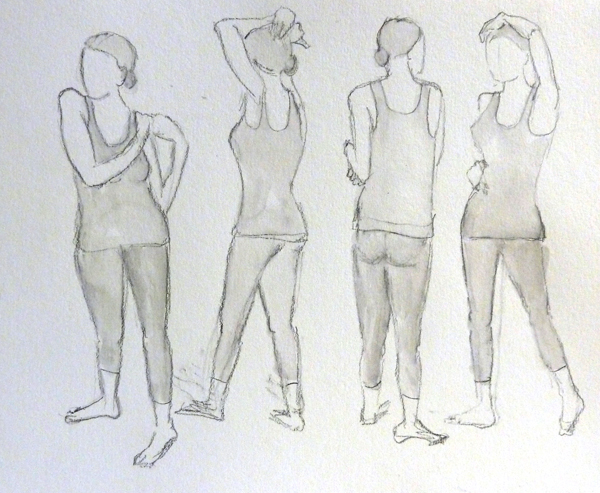 Live model poses are too short to draw hands carefully, and slowly I am making progress. Battery Park City Figure Al Fresca uses clothed models and here are my first 4 one minute sketches and 3 ten minute drawings. These are photos from 11 X 15" paper. 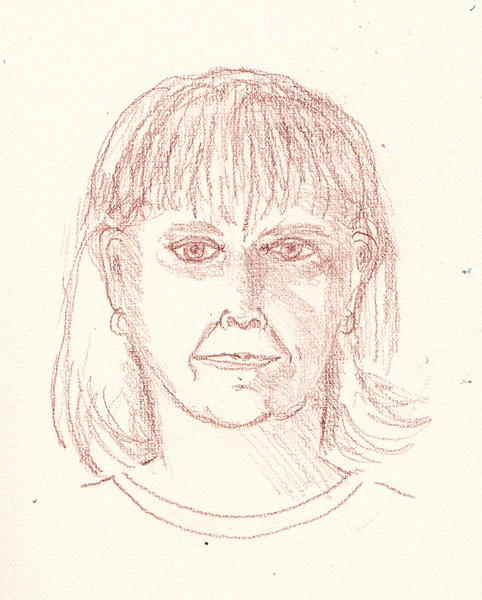 This group meets weekly and I just created a new category for drawings done at these events. My category list in way down under the monthly entries for my blog. 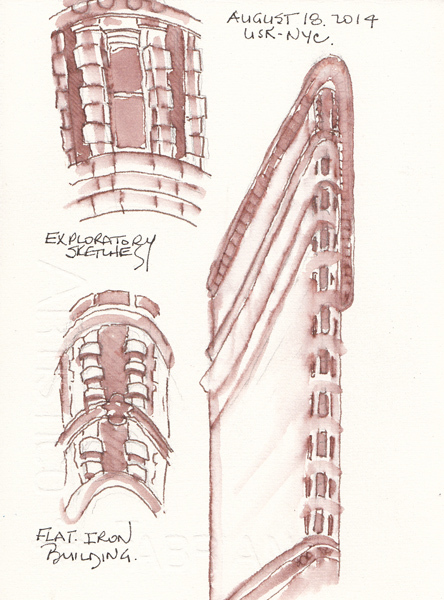 I did a few preparatory sketches, based on Liz Steel's recent demo in Sketchbook School Semester 2 - and overcame my fear of failure sketching this iconic NYC landmark. 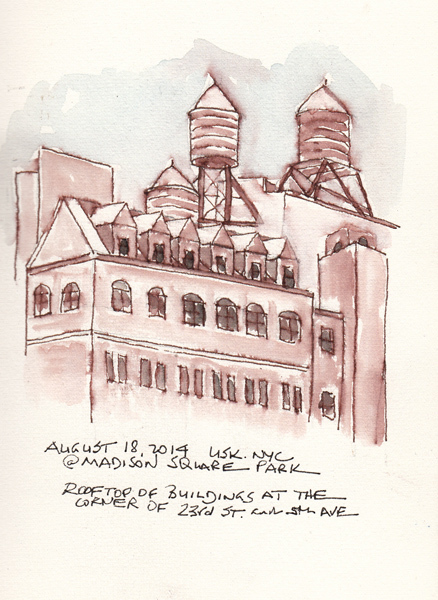 After lunch I searched for another building to draw around Madison Square Park and was drawn to this one because of the multiple rooftop water towers. These sketches were done with a Tombow marker and then "painted" with clear water in a Niji waterbrush. I had an amazing day at The Museum of Modern Art last Friday. My art friends were busy, and I hadn't seen the Toulouse-Lautrec or Jasper Johns exhibits, so I packed a lunch and went at 9:30 when these exhibits opened for Members. The Toulouse-Lautrec exhibit was posters, and many other forms of lithographs from the MoMA collection and I was mesmerized by the lines. I carefully looked at, and photographed most pieces, and then drew one detail from an early poster because I loved it! 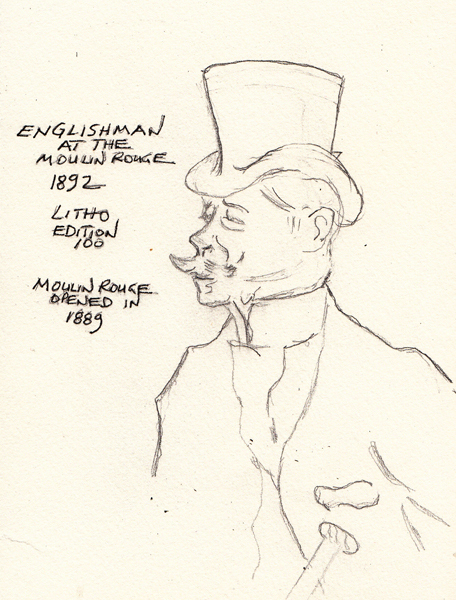 Here is my Englishman at the Moulin Rouge, 1892 - 3 years after the Moulin Rouge opened in Paris. I sketched with graphite and decided to leave it that way. The Jasper Johns exhibit was a collection of drawings, prints, and oil paintings from the last 18 months. Since we saw the exhibit of his work and learned about his printmaker John Lund, I can't get enough information about him. I'm not someone who easily works in a series. And he experiments and cuts printing plates, and reworks much of his art. This series began with a tattered and paint spattered photo of Lucien Freud, sitting on a bed with his head in his hands. Johns drew the images several times in different media, manipulated the image by duplication, and then made two series of prints. I thought the prints were too dark, but couldn't learn enough about his process. They also had one of his number series and I love the shape of his numbers, so I made a grid with 9 spaces and made quick sketches only to find I was one box short because I forgot about the zero. So here is my sketchbook page - to remember the experiences in that gallery. 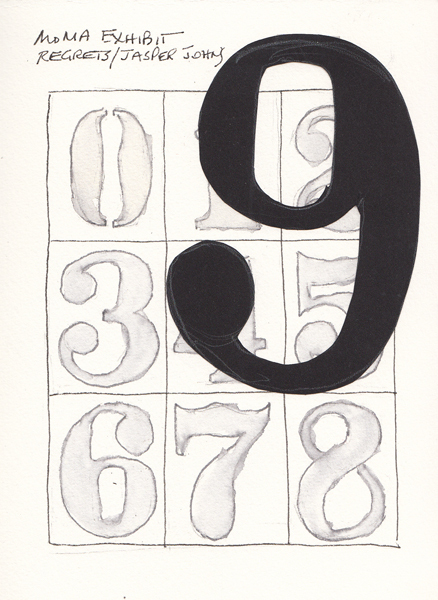 The nine is just a cut-out that overlays the page and can be lifted. By then it was lunchtime, so I took my lunch and bought coffee at the Sculpture Garden Café - and enjoyed the beautiful weather and amazing art. We are going back to Paris for vacation in October and I couldn't resist painting this vintage sculpture from the Paris Metro. 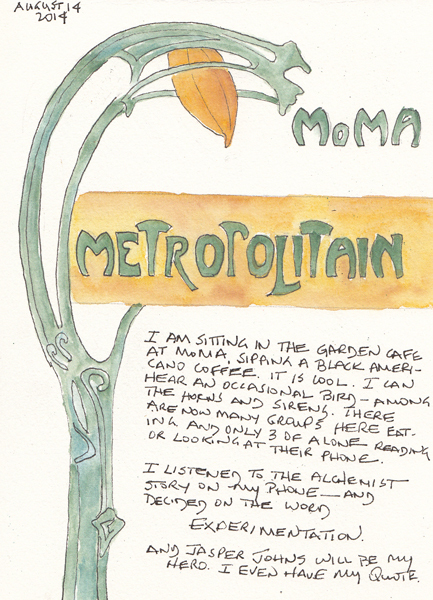 On Saturday I worked on a challenge from my friend Teri while we were having coffee at our favorite café in Central Park. 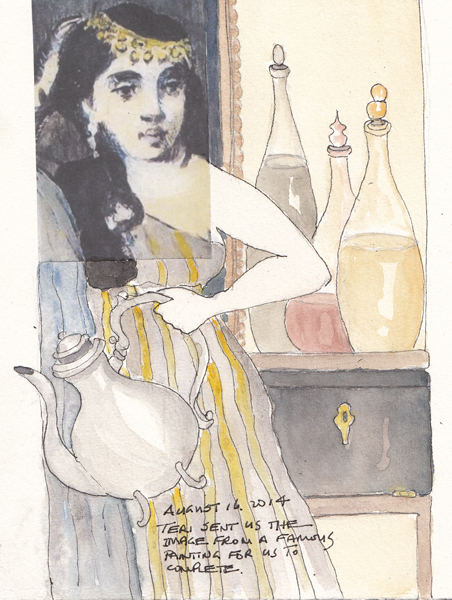 Teri sent us digital images of small details from famous paintings - that she received from one of her art groups. Pat and Benedicte did the first 1-2, but this was my first. If you look closely you can see the original image that I printed out and collaged on the upper left. And then I just played with ideas and completed the painting with my composition. My Art History consultant Bunny says that it was probably painted by a 19th C Orientalist, but I can't find it online. So I must wait for Teri to return from a Dude ranch out west to learn her identity. Any ideas?? The Battery Park Conservancy has several free adult art programs from May through October, weather permitting. 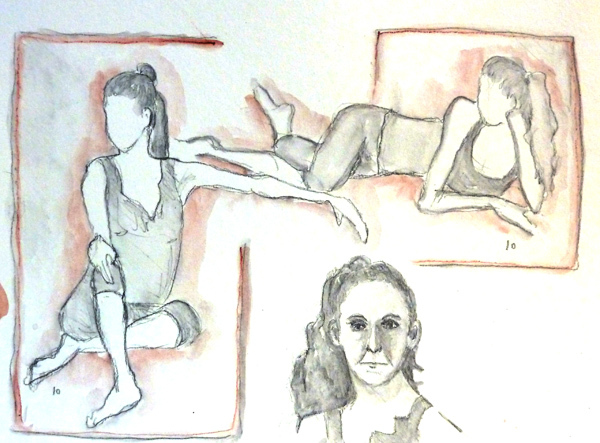 I love to go to Figure al Fresca, the 2 hour figure drawing session using clothed models. But between our beach travels and weather, this was only my second session for this year. 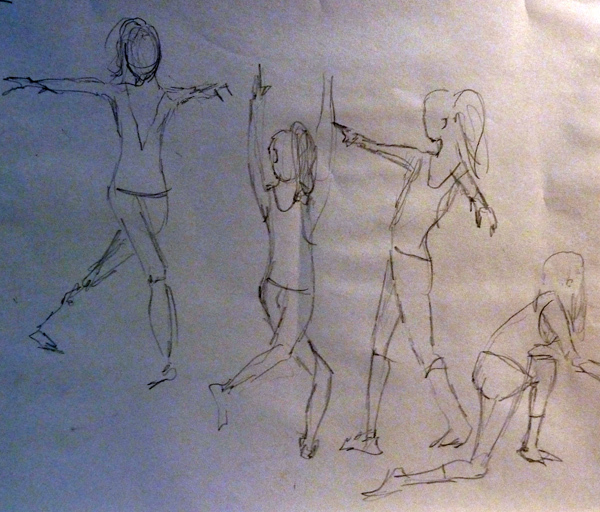 We started with 15 one minute poses - which I did on newsprint to loosen up. 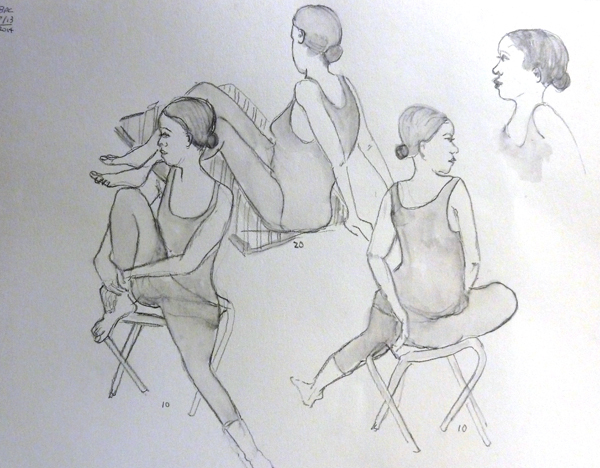 These are the 4 five minute poses which were all done on a large sheet of watercolor paper with a General Sketch and Wash pencil so I could add water for shading. The sheets were photographed because of size. Here are two 10 minute poses, one 20 minute pose and one portrait done during the 20 minute pose because I had so much trouble sketching her head shape. This program continues through October - in the South Cove area of Battery Park. It is from 2:30-4:30 on Wednesdays and art supplies are provided for visitors. So join us if you visit NYC. 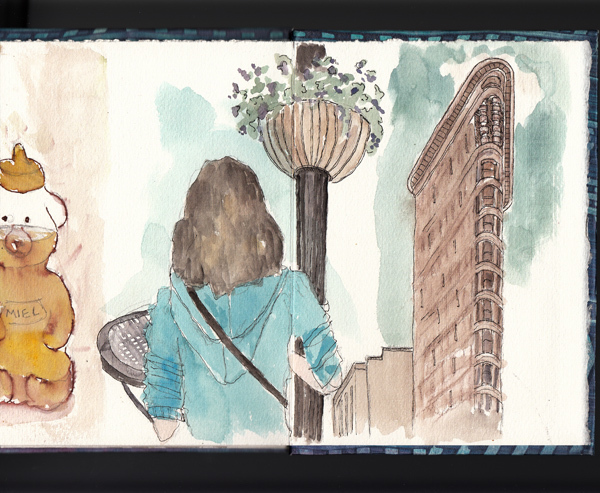 This is the final day of Sketchbook Skool Semester 2 - Seeing. I think that I will continue to work on some of the exercises again, just to play a little more! But I wanted to post some new sketchbook pages now. 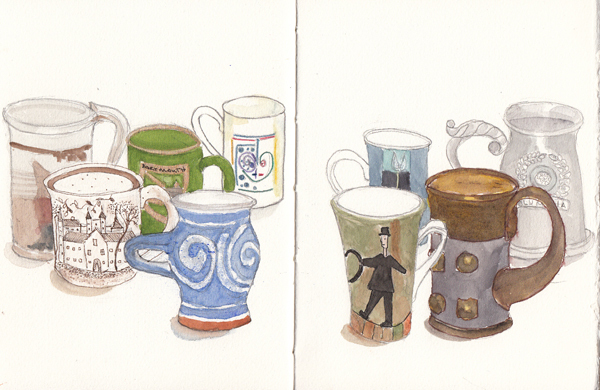 Here is my Mug Collection on a double page spread - which I posted previously only as a work in progress. I added more mugs - and still may add more. But it also may be finished! One more Selfie for Koosje's class. I decided that I would try to do an occasional one over the next few months, even though I did my homework exercise during her class and did 6. I try to work on portraits in general and as Koosje says, "where else could you always find a willing model?" 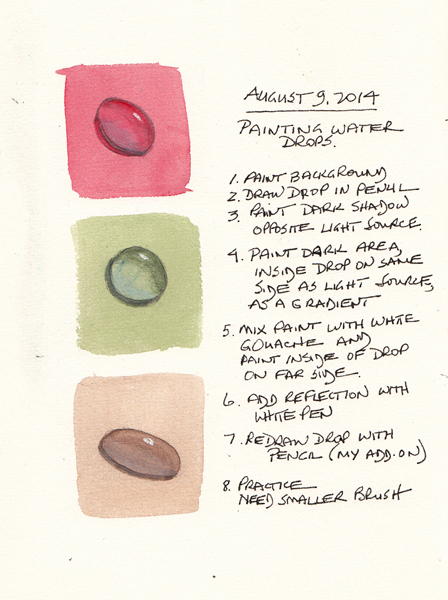 Last weekend I saw a Facebook entry for Drawing Club on how to paint water drops. I couldn't resist trying, and listing the steps for when my memory fails me because I was unable to save a link. Here are my 3 water drops!